For setting deck screws flush to boards. With a 12 Right Angle Flex Shaft, DEWALT Bit Holders enable users to reach nearly any hard-to-reach space. A Rapid Load head enables fast, easy bit changes, and each fastener is supported by a magnet for accurate alignment. A side handle offers additional leverage and support. The DeWalt DWA3HLDIR Flexor 3-in. IMPACT READY Bit Tip Holder with Screw lock System is CNC machined, resulting in accurate manufacturing for optimal fit into the screw recess. A reflex core allows 2-inch bits to flex up to 15-degrees to reduce breakage. These bits are a part of the 10X Magnetic Screw Lock System for fastener retention which minimizes drops and reduces wobbling. Impact ready bits with Flexor have increased durability for longer life. Felo Ergonic<sup></sup> magnetic bit holder with flexible shaft for 1/4-inch bits. Felo screwdrivers are made in Germany with high quality manufacturing standards and 15 Years Warranty. Ergonic, is the first Soft handle that adapts to the user's hand! Hand and handle interlock, causing less strain. Smooth, seamless handle for maximum comfort and hanging hole for easy storage or inserting lever. The impact proof handle core is coated with elastic, scratch resistant elastomer containing cells of highly flexible plastics. The units feature anti-roll handle design and screw symbols on handle cap. 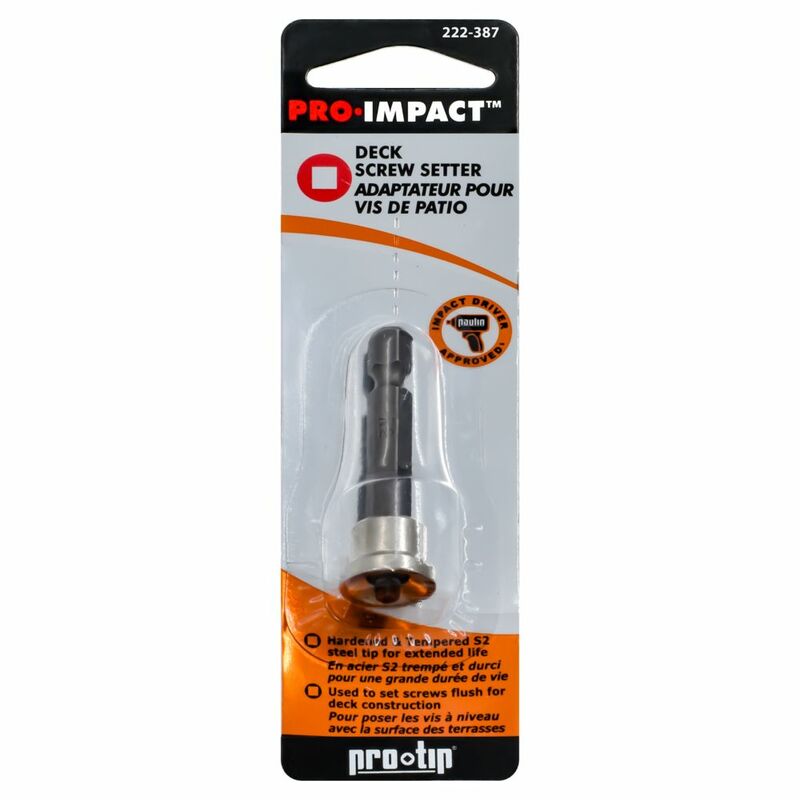 Pro-Tip Deck Setter Premium screw driving bit.